Translation of Visuddhimagga. 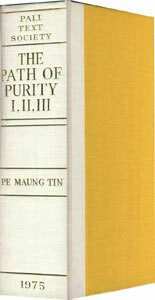 Three volumes, 1923, 1929, 1931, reprinted as one volume in 1975. Considered to be the most important non-canonical work of Theravada Buddhism, this is both a systematic encyclopedia of Buddhist doctrine and a comprehensive guide to the various meditation techniques. Written in the fifth century by the renowned Buddhist commentator Buddhaghosa, this great treatise organizes the various teachings of the Buddha found throughout the Pali canon into a clear and comprehensive path to enlightenment. In the course of this monumental work, Buddhaghosa gives full and detailed instructions on the forty subjects of meditation aimed at concentration, an elaborate account of Abhidhamma philosophy, and detailed descriptions of the stages of meditative insight culminating in final liberation.